Dhaliwal Bakery is a family owned and operated, Indian -style bakery offering award-winning pastries, breads, and specialty cakes for over 2 years. Our convenient central location allows you to comfortably linger and read the morning paper or make your visit a morning ritual before work. We are dedicated and impassioned with bringing you the finest pastries, cakes and chocolates in Surrey by combining traditional techniques with innovative design.We have great artist in cake, chocolate, and sugar competitions. 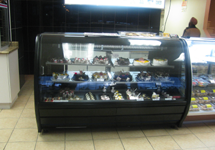 Dhaliwal Bakery are Wholesale bakery. We specialize in wholesale breakfast items, breads, and cookies. Let us help with your special day. Our cakes, cookies, muffins and pastries make a great accompaniment for Birthdays, Baby Showers, Thanksgiving, Christmas, Hanukkah, or any other day that is special to you.